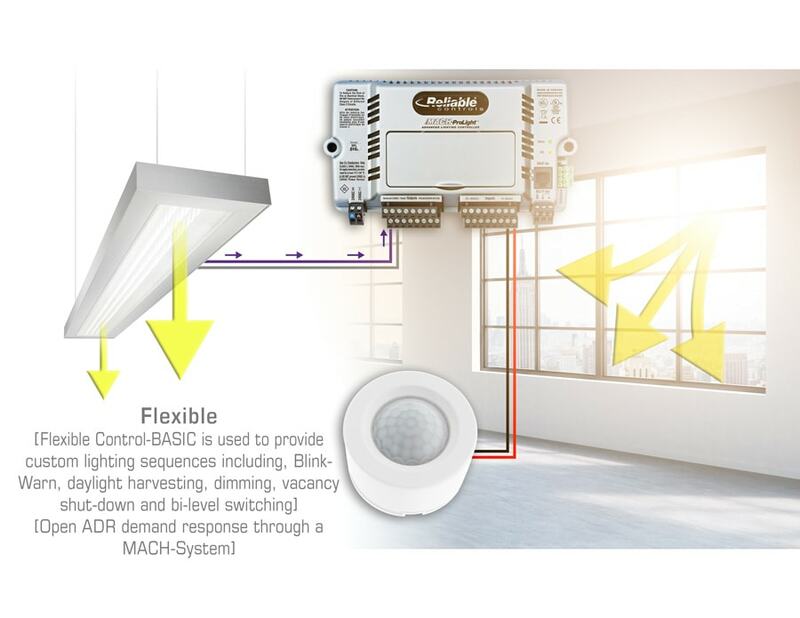 Empower your facility managers to save energy by integrating lighting controls into your building automation system with the Reliable Controls MACH-ProLight advanced lighting controller – the world's first BTL Listed product to meet or exceed the BACnet Lighting Device (B-LD) profile. 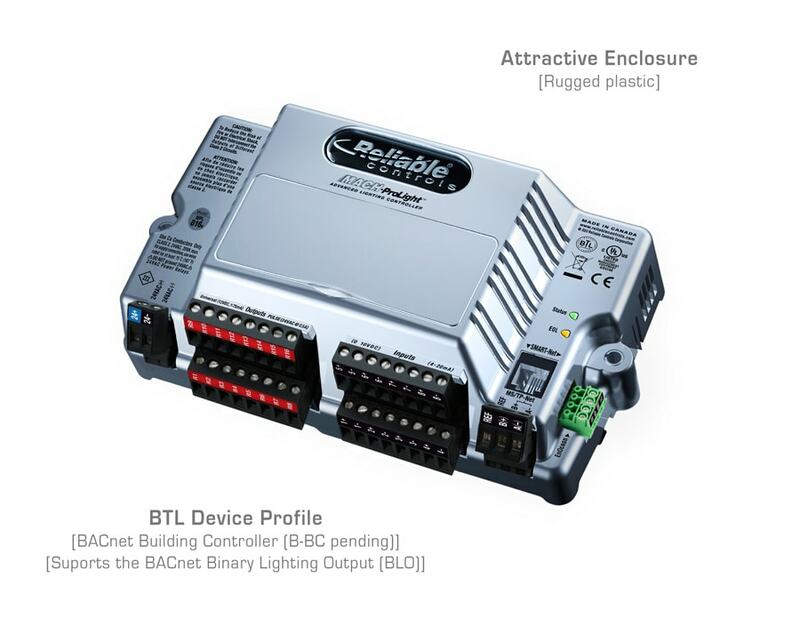 The MACH-ProLight is a freely programmable and scalable BACnet Building Controller (B-BC), providing 0-10 V continuous dimming and BACnet BLO object support. This allows you to implement advanced control strategies such as daylight harvesting, dim-to-off control, vacancy control, plug-load control, and scene/theme control - key strategies for achieving OpenADR and Title 24 compliance. 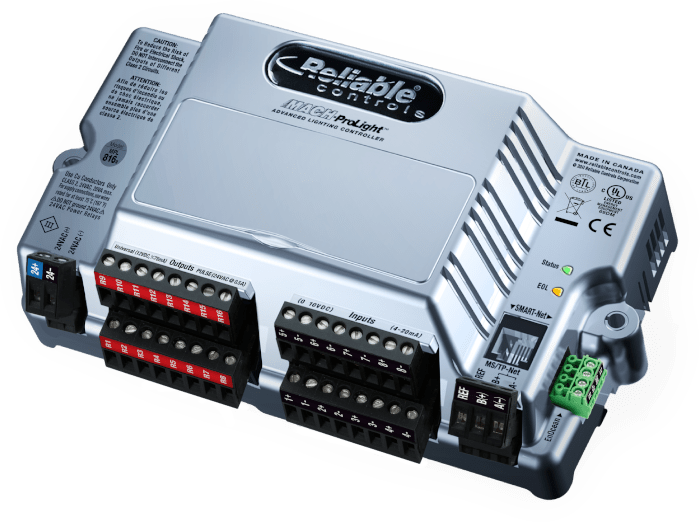 Compatible with standard lighting-control relays, low-voltage peripherals, EnOcean™ wireless products, and the Reliable Controls SPACE-Sensor™ and SMART-Net™ products, the MACH-ProLight conveniently ships in pre-assembled, UL 508A listed control panels, or as individual components. Allows a maximum of 160 objects to be created of any supported type in any model of controller. Typical object configuration table (below) shows the usage of expanded memory. 16000 bytes of programmable control strategy in a readable, BASIC-like language. 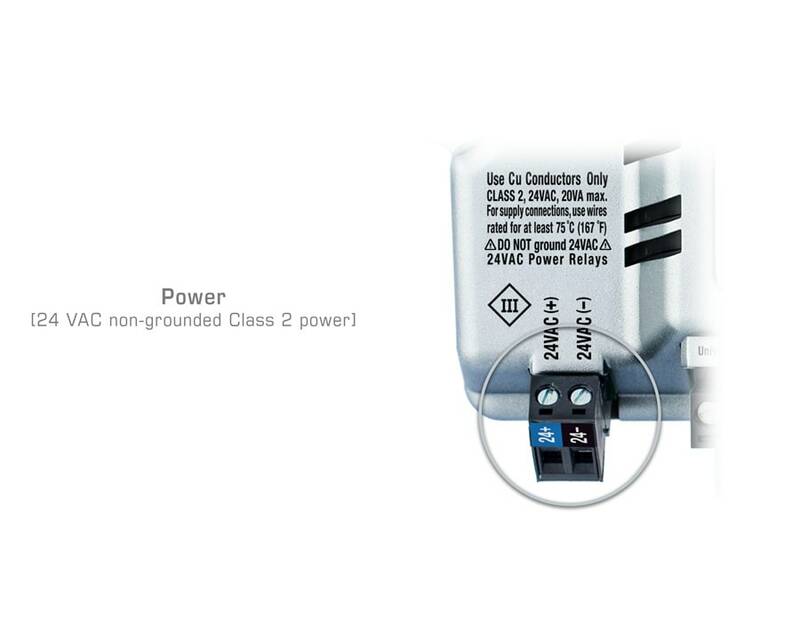 Soft selectable 0–10 VDC, 4–20 mA, thermistor/dry contact. 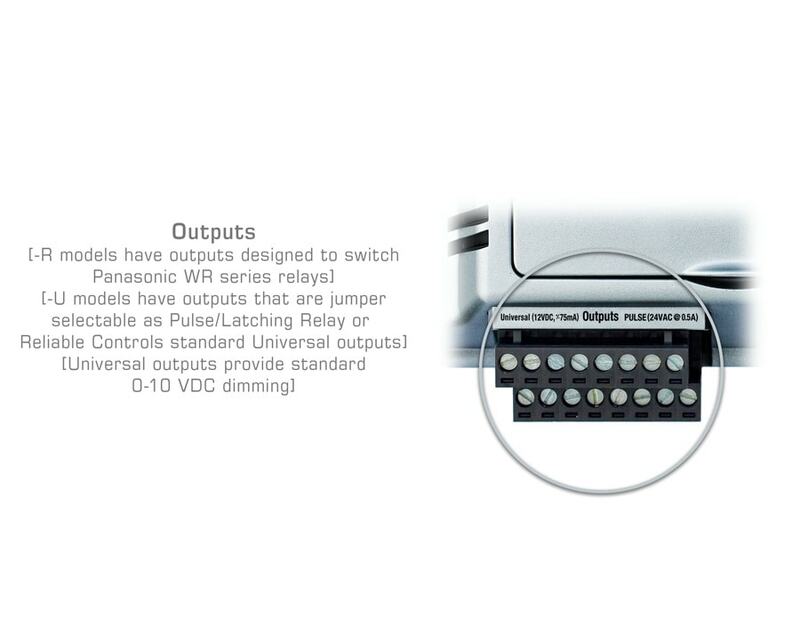 Jumper selectable 0–12 VDC, sink or source, or relay driver. 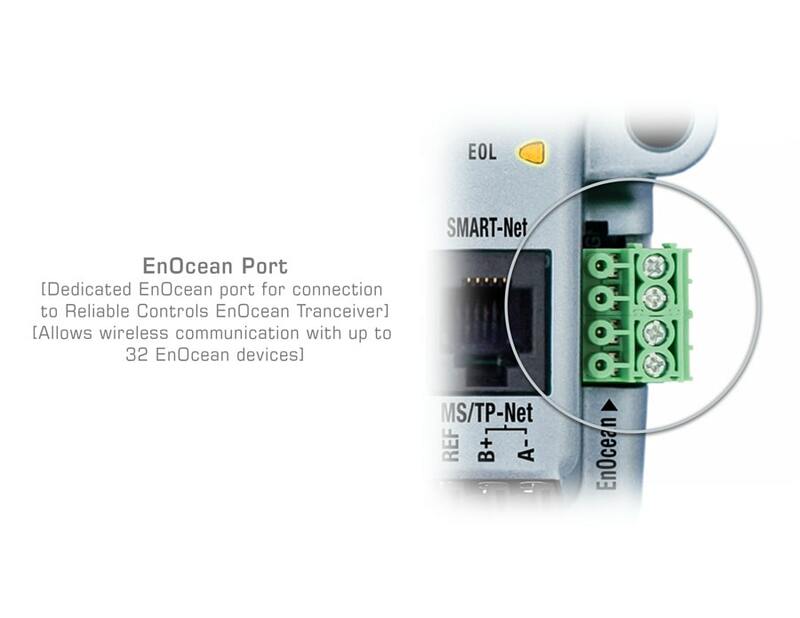 Supports one EnOcean Transceiver (ET). EIA-232, 30 m (100 ft.) maximum distance, 57.6 kbps. Stores 128 samples at programmable time intervals. Each Trend Log stores 128 samples of 8 points at programmable time intervals. Records the total ON time and the total number of transitions, as well as daily transitions for every binary point. A 50 sample runtime log is optional for each binary point. Allows related points to be grouped onto one display. 7 On/Off times for each weekday or exception. 8 multistate units with 8 states, 32-characters each. Networks up to 4 SMART-Sensors™. 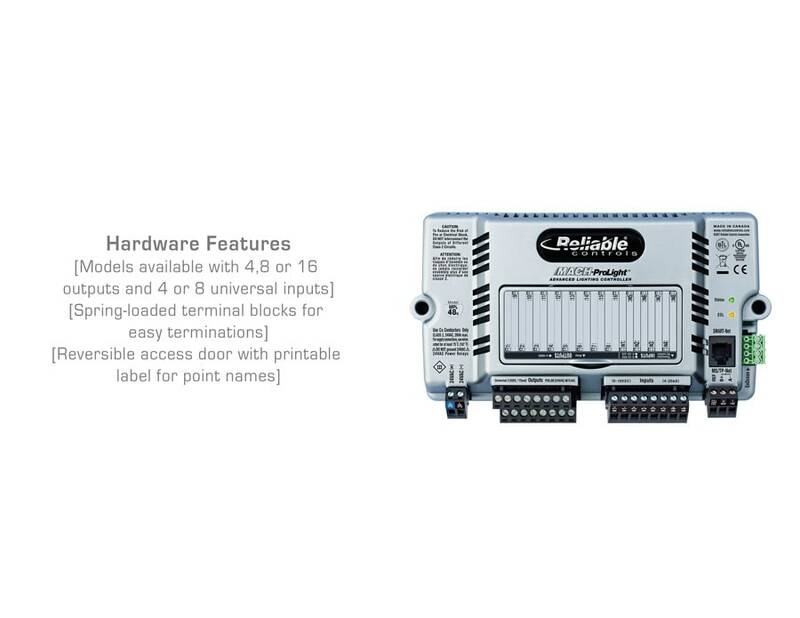 There are physical limitations to the number of inputs, outputs, and SMART-Sensors that can be connected to a MACH-ProLight controller. For other object types, a maximum number of 128 objects of a single type can be created. The total number of objects (including inputs, outputs, and SMART-Sensors) is limited to 160, and is also limited by the onboard memory. The table below details typical databases that fit in all models. * Runtime Logs & EnOcean values are not counted in the 160 object limit while EnOcean device objects do count. Inputs and outputs are counted in the 160 object limit. ** Trends are configured to store 128 samples. 66 MHz, high-performance, 32-bit embedded microcontroller with onboard Flash memory. Controller database, values and configuration held in robust nonvolatile memory. Operating system firmware easily updated at any time over the network. Isolated 24 VAC ±10% 20 VA max. 50/60 Hz. SMART-Net™ port @ 4 sensors max. 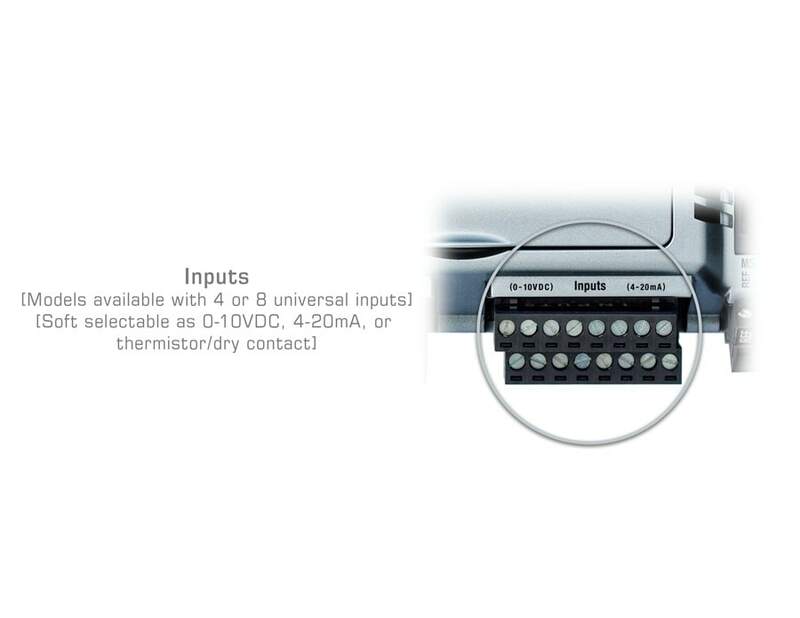 Soft selectable: 0–10 VDC, 4–20 mA, thermistor/dry contact. Impedance: 3M? on 0–10 VDC range. 250 ? on 4–20 mA range. Pulse counting up to 40 Hz (supports flow meters). Output power: ±75 mA @ 12 VDC, sink or source. Jumper selectable relay driver outputs. 24 VAC momentary pulse to latch relay. Single wire connection, connects through to 24 VAC supply to drive the relay. Up to 4 WR-6161 series relays can be connected to one output. Relay status is sensed on the same wire that drives the relay when using WR-6161 series relays. 2 wires are required to drive each GE series relay. Clock operation is maintained for 72 hours with capacitor backup power. 10.9 cm L x 19.1 cm W x 4.6 cm H (4 5/16" L x 7 1/2" W x 1 13/16" H). #8 clearance holes on 17.8 cm W (7" W) centerline. The MACH-ProLight™ Lighting Control Panel is a complete assembly of controls and switching relays pre-wired ready for installation into the electrical system. Panels are built to order as per customers specific requirements allowing a mix of dimming, and switching circuits to be configured specific to the lighting control strategy.